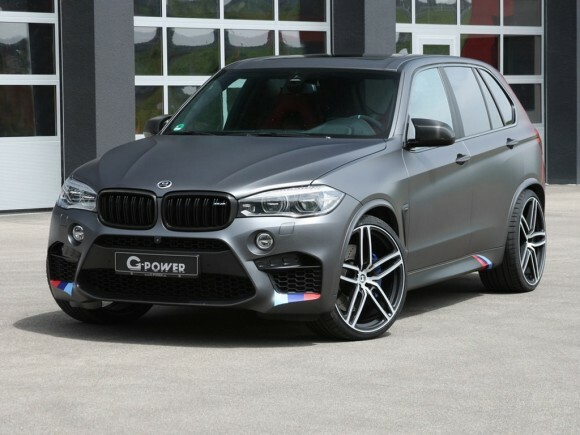 G-Power has launched their latest upgrade kit for the BMW X5 M, which gives it a massive power boost to bring up the total to 750 bhp. A standard BMW X5 M is no pushover with 575 BHP, but this kit takes it to a whole new level. Torque also goes up to 723 lb-ft. Normally the 4.4-liter biturbo engine emits 575 hp. The G-Power X5 M hits a top speed of 186 mph. Other upgrades includes 23-inch forged wheels, coilover suspensions and custom downpipes with catalysts. The second generation BMW X5 M is an outstanding representative of the Power-SUV class, its 575 hp and 650 Nm of torque giving it performance that is the envy of its rivals. G-POWER have shown, the twin-turbo V8 still has significant potential waiting to be unlocked. With 35 years of engineering experience behind them, G-POWER now offers a three-stage performance upgrade programme for the X5 M, taking power to 650 hp, 700 hp and 750 hp. With Stage 1, G-POWER raises output to 650 hp through a software remap. Uniquely, this is achievable either with the G-POWER Bi-Tronik 5 V1 power module or the Bi-Tronik 2 V1-remap. While the engine dyno records an additional 75 hp and 100 Nm of torque for both, each approach has its specific advantage. The Bi-Tronik 5 is a Plug-and Play solution, and therefore imminently suitable for overseas clients. Conversely, as it allows individual programming of the ECU map to a specific vehicle the Bi-Tronik 2 appeals to drivers who require a customised solution. The Stage 2 conversion uses G-POWER’s Bi-Tronik 5 V2 or Bi-Tronik 2 V2 software remap. But first, specially fabricated, flow-optimised stainless steel downpipes are fitted to reduce backpressure in the OEM exhaust system. The software upgrade is calibrated around this to obtain 700 hp with 905 Nm of torque. Stage 3 generates 175 hp over stock, making for an incredible 750 hp. As the OE turbochargers are on the limit of their flow capability, G-POWER re-engineers them with larger turbine and compressor wheels that spin within machined and gas-flowed housings. These uprated turbochargers work hand-in-hand with the stainless steel downpipes and a bespoke titanium exhaust system, which features two rear silencers and four 100 mm diameter tailpipes. Apart from further reducing backpressure and endowing the X5 M with a deeper more powerful soundtrack, this titanium exhaust system also saves a significant 23 kg. The 750 hp with 980 Nm of torque is the result of optimisation using the bespoke Bi-Tronik 2 V3 software upgrade calibrated to the new hardware. Against the stopwatch the big X5 M now blasts through the standing quarter mile in a junior league supercar time of 11.5 sec, on its way to a Vmax of over 300km/h. To match the X5 M’s chassis to the uprated performance, G-POWER fit their GX5M-RS coilover suspension. The conversion is rounded off by a set of 11.0×23-inch HURRICANE RR forged alloy wheels shod with 325/25ZR23 tyres. Made from the highest quality aircraft-grade aluminium, these wheels are not only immensely strong but also amongst the lightest in their class.